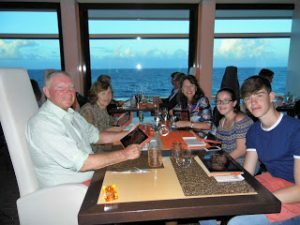 HomeCaribbeanOn Reflection, Our Celebrity Caribbean Cruise was the perfect family holiday! 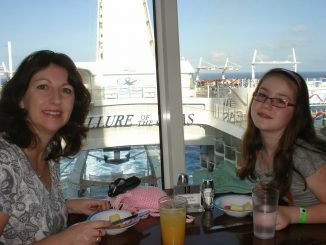 On Reflection, Our Celebrity Caribbean Cruise was the perfect family holiday! I’m standing under a cloudless sky on the top deck of Celebrity Cruises Reflection, as the towers on Miami Beach recede into a balmy haze. 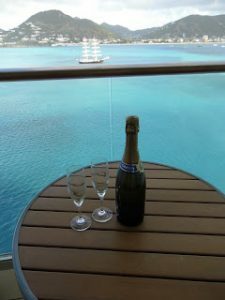 Granddad, Granny, my teen and tween are in their cabins unpacking their bags so they can make the most of every second on the ship and we’ve been through the first world dilemma of whether to go for the drinks package or not. 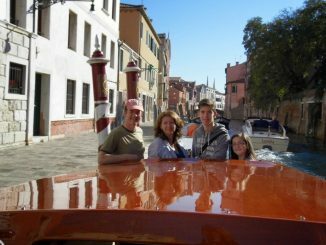 One of the great treats about cruising is travelling to different destinations without having to pack or unpack to do it. 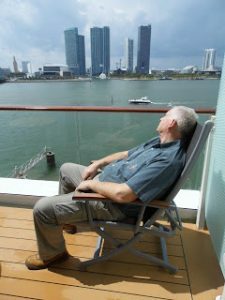 It’s my father’s first cruise and I’m confident we’ve the perfect balance for all three generations on board. Celebrity ships offer a five-star-experience, best described as modern refined luxury. The carpets have a deeper pile than normal and features like extra large showers and curved corners on the beds show that every little detail has been thought through with care. Being cruise veterans my kids know the importance of the first day meet-up in the teen zone. Kitted out with table tennis, video games and a mini stage the teens huge social area is open all day and supervised until late at night and the best part is there are no tacky cartoon characters reminding the teens that they are kids. They move between the grass lawn on the upper deck and the hideaway on deck seven, yet seem to go practically unnoticed by the majority of the guests. There’s great comfort as a parent to know there are only so many places they can be. 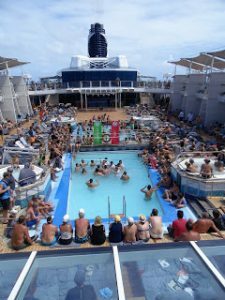 Our first day is at sea giving everyone time to get their bearings and giving me time to try out the spa. The Persian Gardens are a luxury with hot beds looking out to sea and an array of spa rooms. It’s well worth joining for the week and complimentary for Aqua Class passengers. I go for a manicure at Canyon Ranch SpaClub and enjoy the unspoilt ocean view as my feet are transformed with a French polish. 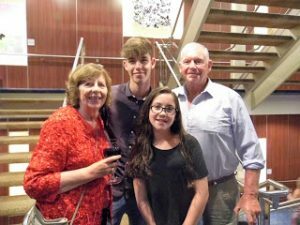 As well as the usual entertainment of theatre, comedy and casino, the art on celebrity is a big draw and Granny and I decide to view the exhibition at a wine event. There’s no pressure to purchase but it is tempting, instead we decide to try our luck at the casino. The fine dining option offers delicious options and just the right size portion. I manage to enjoy my food without putting on too many extra pounds. But it’s Granddad’s birthday and the waiters make a fuss of him when they bring out a beautiful chocolate cake inscribed with his name. As they sing happy birthday to him, I know we will all remember this moment with joy for years to come.Our first port of call is San Juan in Puerto Rico. Immediately the relaxed rhythm of the Caribbean fills our souls as we step into the colonial past and charm of this island paradise. The city has all the modern trappings, including a CVS store and KFCs but my daughter heads straight for the stalls selling traditional sweets made from plantains and nuts. Our guide takes us through a brief history of the old town and past statues of the colonial past and Spanish architecture. Next stop is the bar where the Pina Colado was invented and they make Virgin cocktails for the kids. We have a salsa class before leaving this beautiful island and I know that I’ll be back. 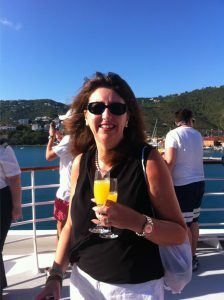 A cruise gives us the chance to sample the best of the Caribbean and plan for another journey in the future. 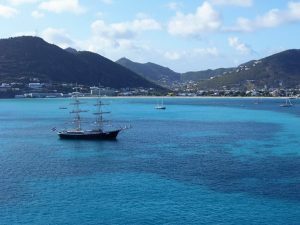 Our itinerary takes us to the neighbouring island of St Thomas the following day. This beautiful island has all the ambience of ‘Pirates of the Caribbean’ including the famous Blackbeard’s castle. We take a taxi from the ship and are left at the town centre among dozens of jewellery stores, even Tiffany & Co have a branch on this island. Not to be distracted we walk the 99 steps up hill to Blackbeard’s Castle and enjoy the spectacular view on the way. 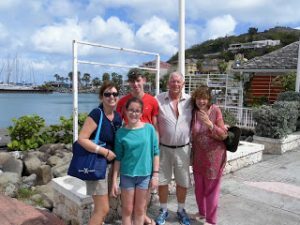 The Caribbean is full of interesting characters and one young man in his 80s stands by a viewpoint and offers to take a photo for a dollar tip − we couldn’t resist an offer like that! 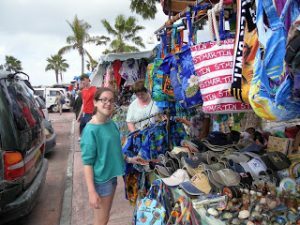 The local market is great for the kids, as they find trinkets and souvenirs for their friends at home. St Thomas is stunning, but the kids want to get back to the ship early to meet their pals. It’s not a bad call as I find myself enjoying the half-empty ship, especially in such a beautiful setting. Granddad can’t wait to get his cabin with all day sunshine on his tiered balcony he gets to sunbathe in peace. Our Tour America agent advised us when booking about the large balcony and suitability for sunbathing which she got spot on. Granny and I are invited up to the heli-pad deck to have a glass of champagne with the senior officers and to our delight a giant sea turtle puts on a display in the water below as we pull away from the shore. That evening we eat at Qsine, in one of the speciality restaurants which incur a small supplement. The kids have fun showing Granddad how to use the iPad menu. Some of the dishes are accompanied by a video cartoon, with ‘Disco Shrimp’ possibly the most entertaining as well as delicious. Incredibly my son passes on dessert because he’s too full but my daughter orders the cupcakes which are prepared with tiny icing bags for her to decorate herself, much to her delight. Later I go with Granny and Granddad to the theatre to see the illusionists show. Entertainment on board is thrilling, something that’s missing from other luxury brand cruises with less guests on board. The Beatles Show is on par with Let It Be, showing in the West End. Equally enjoyable is sitting on my balcony, reading my book and sipping a glass of wine. Carlos our room attendant refreshes the ice bucket daily and brings canapés each afternoon. I’ve grown so fond of him and little niceties like a chocolate on my pillow every evening! 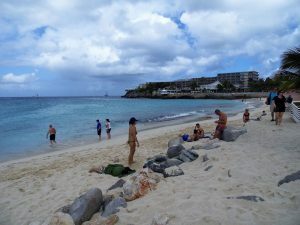 Day four and we wake in St Maarten. The skies are cloudy but in typical Caribbean fashion the sun breaks through after an hour. We take a bus tour that passes famous Orient Beach, but are too early to see the naturists. This unique island is divided in two and shared by the Dutch and the French. Three currencies are accepted but the dollar is the best to use. We loved the bustling French capital with yummy aromas from the patisseries and cafes. 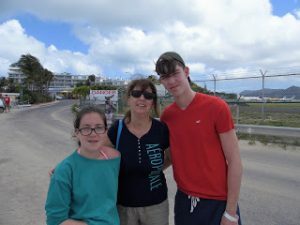 But the highlight is our stop at Maho Beach, noisiest in the Caribbean, where aircraft almost clip the holidaymakers as they come in to land at Queen Julianne Airport. The YouTube clips I’ve seen don’t exaggerate. We still have two more days at sea to enjoy and I feel panicked at the thought of returning to real life. My kids have made new best friends, and Granny and Granddad are talking about where they would like to cruise to next. Teens adore Celebrity because unlike other cruise ships they aren’t reminded that they are children at every turn. In fact it was easy to forget that the kids were with us. We disembarked reluctantly and returned to the beautiful Biltmore Hotel in Miami where we stayed the night before our cruise and last stop before our flight back to Dublin. 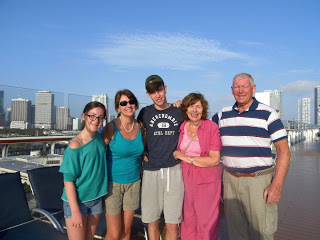 The Three Generations agreed on ‘Reflection’ our Celebrity Cruise was the best holiday ever. Join Celebrity Cruises’ (www.celebritycruises.ie); 1800 932 611*) Celebrity Summit on an eight-night Eastern Caribbean fly/cruise from €1,849 per person (based on two people an interior stateroom). 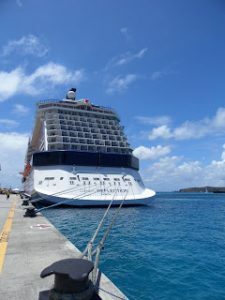 Price includes return flights from Dublin, transfers and a six-night cruise departing from Cape Liberty (NJ) and calling at Philipsburg (St Maarten), Charlotte Amalie (St. Thomas) before arriving in San Juan (Puerto Rico) for the flight home; meals and entertainment on board the ship and all relevant cruise taxes/fees. Price based on 16 October departure. 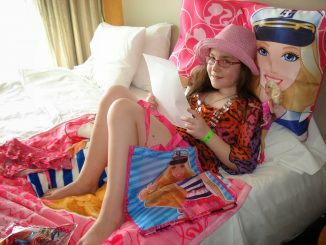 Barbie Girls with Royal Caribbean Cruise Line!